Mindful Design Consulting Newsletter (May 2009). This is our October design newsletter! Today I would like to talk about alternative energy sources. Our energy cost is increasing every day. Is there anything we can do without changing our everyday habits? You will be surprised that solutions can come from unexpected sources. Read on. Check out our Green Corner for the latest updates on Green Power! Remember, it's never too late to become friendly with the environment and to save on your electric bill at the same time! LOWER YOUR ELECTRIC BILL BY UP TO $300 A YEAR! • Completely turn off your consumer electronic equipment (like TVs, DVD players, etc.) and computers at night, not just letting them go into standby mode. • Do you use flood lights on the outside of your home? Install motion sensors around the house instead. • Unplug seldom-used appliances like an extra refrigerator in the basement or a garage. • Unplug your chargers when you are not charging. Every house is full of little plastic power supplies to charge cell phones, digital cameras and cordless tools. Keep them unplugged until you need them. • Set your temperature to 68 degrees in winter during day time and 55 before you go to sleep. In summer keep it at 78 degrees or more. • Use sunlight wisely. Leave shades and blinds open in winter but close them at night to reduce the amount of heat lost through windows. Close shades or blinds during summer when an air conditioner is in use. 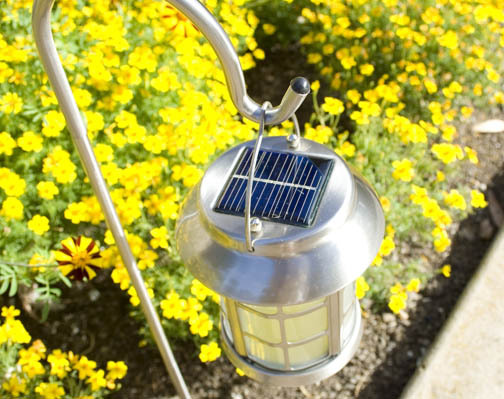 Solar Pathway lights placed on sides of your walkway can save you up to $140 a year. •	Did you know that those little garden lights, usually placed alongside a pathway, can cost you up to $140+ a year in electricity? Why not let the sun power them instead of the utility company? • Or that replacing your outdoor fountain pump with a solar powered pump could save about $100 a year? • Other examples of where solar powered lights can help you save your money: garage sensor lights, illuminated addresses or small spot lights in your garden. All these can sum up to a pretty substantial amount of money by the end of a year. 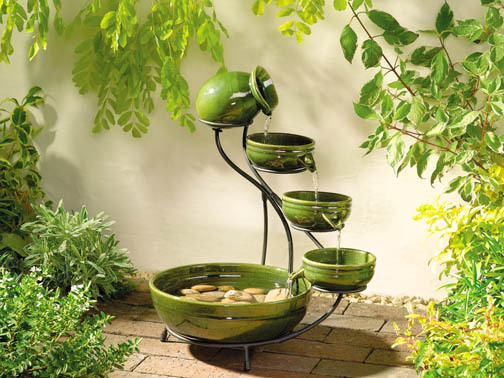 This cascading Solar Powered Water Fountain can save you around $100 on electricity (a year) if you replaced your old electric fountain. It is completley self powered by a small solar panel. Try to choose the sunniest location for your fixtures to get the most benefit from the sun. Use this Solar Calculator to figure our how much money one of your light bulbs will take out of your pocket. Did you know that the first photoelectric effect was discovered in 1839 in France and in 1905 Albert Einstein described the nature of light and photoelectric effect and won a Nobel Prize for it? Our space industry has been using photovoltaics since the 1960's. And finally now us as consumers, we are starting to see the benefits of solar power. If you’d like to learn more, watch this fun video on the process that occurs inside of the panels themselves. 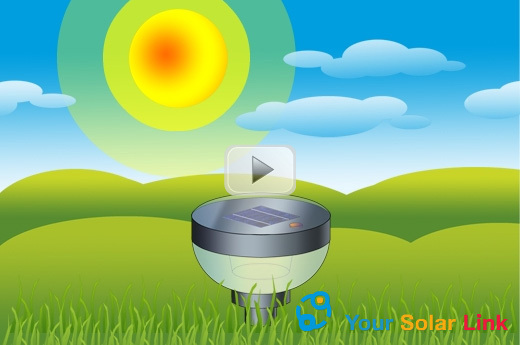 Learn more about Solar Power with this fun video. Solar lights come in different sizes and styles. Everyone can find something appealing for the front of their house or for their garden and start saving right now. You can hang solar lights next to your entrance, above your stairs or on your fence. You can eliminate your mailbox or your home address. Even though the solar cell on the fixture is strong enough to obtain the charge on a cloudy day, try to choose the sunniest location for your fixtures to get the most benefit from the sun. The charge will last over 8 hours. Most models will also turn on and off automatically so you don’t have to think about it every night. There is no wiring for installing solar fixtures! Each solid aluminum fixture absorbs energy from the sun to power two high output white LED’s during the night. 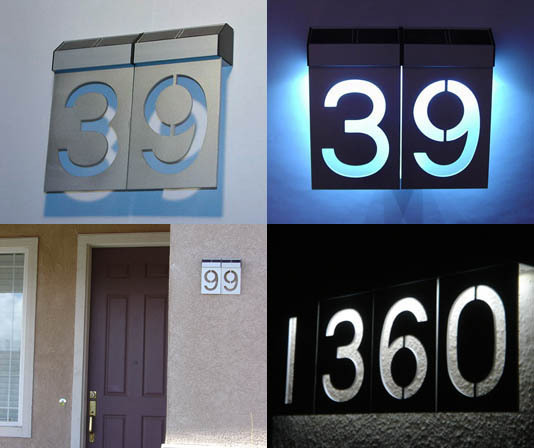 The plate projects 1” from the wall, the LED’s will illuminate the background to reveal the number. 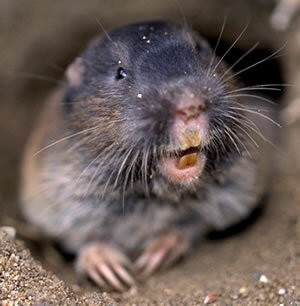 Do you have a problem with rodents but don't want to kill any animals in your garden? This is an environmentally friendly pest control device which emits a powerful ultrasonic wave through your lawn to eliminate ground hogs and other varmints. Effective coverage about 7,000 SF (or 650 square meters), and emits sounds underground every 30-50 seconds. There are no batteries to replace or wires to plug in. Its solar powered panel makes it ideal for do-it-yourself homeowners. For best results, place the 2 units approximately 60 ft. apart in the highest hazard area. Read more. INTERESTED TO LEARN MORE ABOUT ENVIRONMENTAL DESIGN?